Let’s talk about motivation. What drives you to ride your bike or walk? Why on earth — especially during these sodden, cold winter days — do you commute via bike or feet over a warm, dry car? A little housekeeping first: when used in the same sentence as bikes, commute has many definitions. Most people associate commute with work. But work isn’t the only destination for a commute. What about school? or play, activities, errands, appointments, or even to run kids here and there? Maddie, for example, is a bike commuter in our eyes. And for the purpose of this article, if you use a bike to “get around” (say, any use not strictly for sport), then you are a bike commuter too. This article mostly refers to “bikes.” But if your needs are better met by mentally substituting “walk” or “scoot” or “multi-modal” instead of “bike” as you read this post, you have our blessing. You’ve heard of first world problems, right? Most people who live in the world’s wealthiest nations have abundant choices. One of those is the option to choose our mode of transportation. To get from point A to B, we can drive or walk or take the bus or use a bike, a scooter or a unicycle, or even hire a town car. Us first-worlders are blessed (cursed?) with commute options. Yes, those are great and valid and noble goals. But what’s the real reason? The driver. The motivator? Why do long-term, regular bike commuters leave their cars (in the driveway, in the parking garage or on the dealers lot) and choose a bike instead? Keep pressing folks for reasons and things start getting interesting. Tim talks a lot about bikes providing freedom. He thinks freedom encapsulates some of those “typical” ideas (freedom from the expense of a car, freedom from traffic, freedom of the tyranny of the gym, freedom that comes from the knowledge that you’re not contributing, as much, to environmental Armageddon). For others, bike riding contains a spiritual element. Maybe a connection with the planet. Zen. Self-reliance. For me, it remains joy. Last month I wrote about the joy of getting groceries by bike. For me, it’s not just about money, or fat, or saving the planet, or … . it’s about personal happiness and finding joy in everyday tasks. I do take issue with the idea that saving money is not a great reason to ride. There is a great blog that shows that biking vs driving saves a family somewhere in the ballpark of $100,000 in 10 years. That sounds like a pretty damn good reason to ride to me. Sure bikes save money. But I think people get hung up on this. I’ve read cost-calculators on bike commuting web sites. But let’s face it, taking the bus is cheap too. And walking is even cheaper. People still drive. So will saving money drive you to hop on the bike each and every day through rain, fog, sleet and snow or heat and humidity in the summer? Is money alone a good motivator? Face it. Cars are cheap. At fifty-five cents a mile, I can justify a quick trip to the store or to run my kid to school or a friend’s house, or to the gym or (insert destination). Until gas reaches $20 Per Gallon, most people will rationalize their car driving along with all of their other oil-driven consumption habits. For many of us choice-laden first-worlders, I don’t think riding bikes (or not) is an economic decision at all. 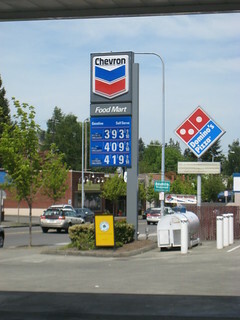 In the United States, gas and cars and roads are subsidized. Which makes them relatively inexpensive for the value provided. Besides, we’re all comparatively rich. We can more than afford to drive cars on this infrastructure we’ve designed for the cheap automobile. Even as gas prices increase a tiny bit, we’re still more busy than ever. We all know time is money and because cars are faster than bikes, it’s actually cheaper to drive! If bike vs drive is purely an economic decision, we’d be foolish to bike instead of drive. I have read the calculators that multiply the bike vs. car savings over time. The internet is rich with stories of people gaining financial freedom by giving up stuff. From early-retirement “badass experts“, to get rich slowly, to getting your life back, they talk about cutting back on “stuff” as a path to financial freedom. Some preach about “getting rich” by saving a little on day to day items, making your own coffee and lunch instead of buying lattes and meals at restaurants among other things. Riding bikes is one of the ways, each 55 cent trip adds up, right? The fact is, the latte method of saving money won’t make you rich. Helaine Olen, author of “Pound Foolish” discusses this trend in her interview by the Economist. She says many of these American, self-proclaimed financial “gurus”, have limited expertise/training in the field of economics. Yet they make money giving financial advice! From where I sit, saving money (or gas or losing weight) isn’t enough of a motivator for most people. When mom or dad buckles their kid in the car to go to school, are they thinking about how much that trip will cost them? Do they weigh the amount of money they could save by leaving their car at home? I loved this story about the monetization of time and how it backfired on an Israeli daycare. I first read about this in Freakonomics in 2005 and again in Daniel Pink’s Drive. An Israeli daycare tried to charge parents for being late when picking their kids up from daycare. But the plan totally backfired. When the daycare put a price on being late, lateness actually increased! Because busy parents realized the price of being late was a bargain. Instead of having to worry about how your tardiness might impact your relationship with your child’s teacher, or how it made you look pathetic in the eyes of the other parents, it became a strict transaction. Pay a tiny bit more and reap some pretty large benefits. more than 82 percent of trips five miles or less are made by personal motor vehicle. No wonder citing stats doesn’t curb the average American’s driving habits. Paired with the knowledge of how cheap it is to drive, it’s finally sunk in. Driving makes financial sense for many people. If I quantified every car trip and put a dollar amount on all of those less-than-a-mile-trips I make on a daily basis, I’d realize how cheap it really is to drive. You mean it’s only going to cost me fifty-five cents to drive my kid to school? And it’s raining? And we’re late? Totally worth it! What if you put a happiness value on walking to school instead? If I take ten minutes (or 20 minutes) to walk or bike with my kid to school, I have a chance to have some fun, and talk to my neighbors. 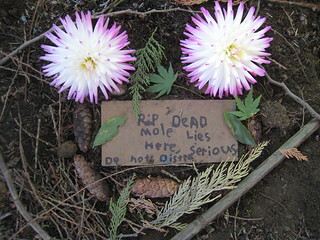 I might slow down, engage with my kid and discuss the intellect of crows or gather dead moles and plan their proper burial. I might ponder whether or not dogs can sense whether humans like them or not. Hmmm, can they? Or we might run into a friend and spend ten minutes before school walking and discussing Minecraft. My kid will also accomplish something (riding up a hill, or walking up a hill), and feel pride in getting there on his/her own power. (Yes, even a ten minute walk feels like an accomplishment to a four-foot-tall person). When you look at it this way, NOT walking or riding to school has a pretty stiff price. Self-esteem. Family time. Fitness. Community-building. Whoa. The cost of choosing driving just went way up beyond 55 cents/mile. Or What about a Social Cost? Let’s go back to that daycare example. Once those un-priced social costs were out of the picture, being late became easy and cheap, and socially acceptable. (And also unsustainable for the daycare). It turns out, the system we’re all familiar with (don’t be late because it’s not socially acceptable), as imperfect as it can be, works best in most cases. A pure financial cost (or savings) isn’t always going to drive motivation in the intended direction. Daniel Pink refers to this pure financial cost as carrots and sticks. External rewards (money) don’t work as long-term motivators. Even if they do work for a little while, they won’t last. As soon as the initial buzz of saving money has worn off, we’re back to our old habits. What if we could add some of the unquantified, but very real social costs that keep daycare pickups on track, to the “do I drive or not” equation? What if it was socially unacceptable to … [drive your kids 4 blocks to school], [fill the roads around our schools with dangerous cars and pollution], [not spend a few minutes walking and talking with your child]? The equation becomes radically different. Sure, for some parents the ability to buy time may win. A difficult work schedule may mean the driving-dropoff — even with social costs factored in — is the cheapest solution. At least initially. But what if more people start walking and riding? And it becomes more commonplace to see sidewalks packed with kids every morning? And we all do it enough that it becomes a habit? Maybe the idea of sending your kids, on foot or bike, with other kids no longer seems as dangerous and socially irresponsible as it once did? That opens the possibility for the equation to shift and the parent to consider the value in other ways of getting to school. Bottom line, people make choices that make them feel good (or at least less bad). The problem is sometimes we don’t choose, we just do. Habits are formed and maintained every day. Considering the ease and ubiquity of our car-oriented society, driving is often a habit. Which means people need a powerful motivator to help them to buck the system and ride (walk/bus/scoot, etc) instead of getting into that cheap, warm, dry car (with tunes! and coffee!) every day. We regular riders (and wannabe riders) have made these choices and are driven by these motivators– we may just not be able to articulate them to ourselves yet. Maybe we started with one: saving money, or getting in shape. and shifted to something deeper; freedom, joy, spirituality. For the commute curious, the “winning” motivator may not be known yet. For me, wanting joy and happiness and simplicity is the reason I ride and walk. For Tim it’s freedom. Why do you ride? Is money your motivator? Or happiness? Or something else? I’d love to hear your thoughts in the comments. This entry was posted in alternative transportation, bigger than here, bikes, Commute, Everyday Biking, sustainability and tagged biking, Commute, motivation, walking, why commute by bike?, why?. Bookmark the permalink. This is such a great post! I really looking forward to seeing what other people say here in the comments. My family lives in a small Kentucky town, and for about two years, I didn’t have a car and we relied on walking and bikes to get around. My sons were 4 and 9, so the little guy rode in the back of our Madsen, often with the little girl I babysat. We homeschooled, and didn’t really have a busy schedule, so it was fine and good for the most part. My 9 year old liked biking, liked feeling strong and being able to climb hills for the first time, etc.. I think we both liked the somewhat notoriety as there were only a couple other car-free mamas in town, so it felt good to smugly ride by the parking lots and park at the door. The joy and spirit of cooperation my older son and I developed was so powerful and moving. Biking was a wonderful thing to share. It was physically demanding, as the Madsen loaded with two kids is really heavy, but our trips were almost always less then two miles and I was in awesome shape. Anyway. Fast forward a couple years and as our financial situation improved, I bought a minivan (cue the ominous music…). We hardly ride anywhere anymore and it makes me really sad. My kids are in school now, and we’ve only ridden to school a handful of times. My now 11 year old has a bad taste in his mouth about riding, as neither of us are in the good shape we were and it is harder than it used to be! He emphatically states he’s not interested in commuting to and from school by bike, and points out that the way home from school is pretty much all uphill (He’s right. It’s demoralizing.) My now 7 year old is too darn heavy to carry in the Madsen but can’t ride his own bike yet in traffic. Not to justify, but I’m thinking we need a new bike set-up. The Madsen isn’t working for us anymore, and I’m not sure what would be best. I really want to make a change back to where we used to be, but it isn’t happening naturally. I’m realizing that merely having a car makes it way more challenging to maintain my commitment to biking. And all the motivators in the world aren’t getting me into the garage, tuning up our bikes, and waking up 10 minutes earlier so we can use the bikes to get to school – it really IS all about habit, isn’t it? I’m curious if anyone has any thoughts about our situation, or suggestions to ease our entry back into regular biking, as Spring is coming and I really want to re-commit to going by bike. I hope this isn’t over-sharing, I really appreciate your perspective and so admire your openness and honesty about the choice to go by bike as a family. Katie- I don’t have any suggestions for you as far as getting back into family cycling as I only have myself to get around. But, I think it is really awesome you want to make the effort! I was curious where you are from in Kentucky. I grew up in Richmond, Ky. Also, even though your 11 year old may not appreciate cycling now I bet he will when he looks back on it when he is older. Maybe if you get back into cycling by just riding some neighborhood routes for fun then you could work the school commute back in eventually and it won’t seem like such a chore. Good luck! Megan- I live in Berea- small world! I appreciate your thoughts, thanks. Hi Katie, Thanks for the thoughtful comment. I hope someone with small town riding experience will chime in with some tips and advice. Are the roads safe for kids? How far is your bike commute to school? Does your son ride with you? Or ride alone? Would more independence be a motivator for you or him? Now that our daughter is in middle school, she loves the freedom and speed of her bike. She likes riding to school. Yes, she still complains about the hills, but that’s OK, I just let her complain. She has a climb on the way to school, and it’s downhill on the way home. I think the downhill home is a motivator for her – getting home is so fast! We’ve gone through our share of kid rebellion when it comes to biking. They often tell us they don’t want to ride. Most of the time we just make them, that’s the privilege of being the parent, right? . But if Tim or I is not feeling motivated, it’s much more difficult to motivate the kids! I’m definitely not perfect and sometimes I just don’t feel like riding either. You’re right, having a car in the driveway/garage makes it easy to justify using it..
Maybe work on getting your bikes tuned so they’re ready to go, and just try once a week at first. Baby steps work for me. How about you? Anne, thanks for your good questions, figuring out some of the answers to them will help me determine a good plan for action. I think if my 11 year old had a couple friends to ride with he would be more excited about it, our school had “bike to school” one time last spring, and it was so fun- it was like a party on the way to school- both boys would definitely like some friends along for the ride. And I could organize a bike-bus just from the kids on our street- that might be a good way to have some accountability for me and more motivation for the boys. Also, next year, he’ll be in middle school and 12, and I will feel better about him being more independent around town, that will certainly make it more fun for him as well. Our town is generally safe for bikes, it’s a college town, so even though it’s small, there are a good number of bikes around, and there’s a large “multi use trail” that we could use for part of our commute to and from school. Some people don’t like it because they’d prefer real bike lanes, but it is nice for kids to use. Thanks again! It’s so encouraging to read everyones comments! Katie- We started out with a Madsen when we had two little ones + a third that I babysat. Two years later, with the kids growing up and no longer watching the third, we sold the Madsen and switched to an Xtracycle as our primary family bike. Much lighter and more practical for me to ride sans kids for errands between school pick-up/drop-offs. Maybe plan on riding to school just one day a week to get the habit going again? Prodding my second grader to ride on her own 1-2 times/week has blossomed her own desire to ride full-time after a few months. Good luck! Matt- It’s really good to hear this! I’ve got a great Trek hybrid that is my “other” bike, and I’ve been really thinking about going the Xtracycle route. I feel so loyal to the Madsen, it was SO amazing and wonderful when I had toddlers, even though I don’t think it’s suiting my needs anymore, it’s tough to let it go! It’s great to hear your experience, thanks for sharing. It takes me roughly the same amount of time to bus to work instead of biking (excluding Friday evenings when traffic is a nightmare and the bus takes an hour). I prefer to bike because it just makes me happy. I feel awake when I get to work and rejuvenated when I get home. I am more spontaneous. I’m more likely to make a pit stop to catch some live music or enjoy a sunny patio. I feel like I can pedal away all of my problems from the day. Hi Megan. I bet it feels good to beat the bus home! I too like the spontaneity that bikes bring. The freedom of making impromptu stops is the best. The thing I don’t like about the bus is all the waiting. I guess I don’t ride it enough and don’t trust myself not to be late and miss it. So I end up arriving at the stop super early and waiting way too long. I usually wish I’d just ridden my bike! We just got car2go in Seattle. I think it might replace my bus use – bromton/car2go with 2 people will be easier and less $ than the bus. Hi Chris, Thanks for the thoughts. Your commute gives me a headache. That’s a lot of variables. 29er Xtracycle sounds like the perfect solution! One motivator among many for us is helping our children acquire independance and self-reliance. I couldn’t agree more! My daughter loves the independence riding her bike has taught her. She’s a confident rider and I completely trust her to make good choices. It helps that she’s been either on the back of my bike or riding her own in the road since she was 5. I just wish other parents would let their kids have more independence. It’s lonely at times for independent kids! What is the fun of having it if your friends don’t? We read Chris Balish’s book How to Live Car Free and talked about going car free, but never really did anything about it. I’d ride my bike to work then home for supper. When it was time to go back to work, my wife would say, “take the car, I don’t need it this evening.” So I’d hop in car and drive back to work — a 1.5-mile drive. Then the car broke down and we didn’t have the money to fix it. That was August 2012. Here it is Feb. 1, 2013 in Indiana, and we’re still car free. I love the freedom. Our 9-year-old son is learning valuable lessons. He loves to walk and he finally learned to ride his bike in November. We’re looking to stay car free for the foreseeable future. I haven’t read How to Live Car Free, I’ll have to check it out. Thanks for sharing your story! Anne, I got the title of the book wrong. It’s “How to Live Well Without Owning a Car.” It was published in 2006 by Ten Speed Press. These are excellent points, Anne. I started cycling when we were expecting our first child: I was overweight and realized that I needed to quickly figure out how to take care of myself before I was responsible for taking care of another completely dependent person. Cycling seemed like a good place to start. As my family has grown over the last 7 years, I have found so many more reasons to ride and to leave the minivan parked at home, but that first motivation is still my primary motivation. Cycling keeps me and my children (and in a roundabout way my community) more healthy. It’s hard to put a price on that. Hi Matt, I completely agree with all of your points. Health is something that’s easy to put off until another day. I realized when I started playing in the park with my kids that I needed to get in shape! Riding everywhere sure helps! Cost, environmental awareness and physical fitness I think are all good reasons, but for me they’ve always been fringe benefits to the fact that I just like to ride. I go out and ride my bike for fun, with no useful destination, so why wouldn’t I do it for practical reasons as well? This is also the reason why the value of time argument a driver might use is irrelevant to me specifically (though it may be perfectly reasonable for them). Sure, it takes me longer to get where I’m going, but I’m multitasking by performing my hobby while I commute. I enjoy the extra 20 (give or take) minutes biking as much as any given driver would enjoy the extra 20 minutes at home doing whatever they do for fun after work. The same reasoning is why I don’t mind the extra time required to travel by public transit: there’s a good chance I’d be using my potential extra free time reading at home, so why not read on the bus? It also plays into the physical benefits: plenty of people insist that they wouldn’t have the time to commute by bike, but then make time for a few hours a week at the gym. Which is great if the form of activity you most enjoy is something non-mobile, like weights or Zumba or whatever. But for me, if I’m working out, it’s probably cycling, so I may as well be getting somewhere at the same time. Anyway, that’s a long explanation for the short answer I started with, which is that I don’t ride because it’s cheaper, or because I feel a moral imperative, or because it works off the beer: I ride because it is, to me, fun. Everything else is just gravy. Hi Joe! Fun is the ultimate motivator. I like your point that everything else is gravy. So true. I’ve got lots of arguments that get me in the saddle, money, environment etc… The one that keeps me there is Wheeeeeeeeeeeeee! I’ve had all the arguments with my mother-in-law who has been suspicious of carrying a kid on a bike. She’s never ridden a bicycle so never got it. Recently we got her on an adult tricycle and five minutes did more for our relationship than years of talking has. I’ve been off the bike for the fall and winter due to a hip injury and a newborn and I miss is in ways that no reasoning can explain. We’re probably getting an electrified bullitt to get the whee back in our life. Wheeee is a good one! I’m impressed you got your mother-in-law to try a trike! That’s impressive. I hope she’s still riding. She didn’t like how the trike handled, we were out visiting her sister but she wants to learn how to ride a bicycle this summer. No trikes for her. I’m working on fixing an old fuji for her. The other thing that keeps me on the bike is connection, I know more streets, know all the mailmen in the neighborhood and have a more connected life than most people I know. I saw this post yesterday morning then had exactly the kind of day that defines what I love about biking. My 6 year old son and I rode our xtracycle to pick up another kindergartener for bikepool. Along the way I asked him what he loves about biking and he said, “We don’t burn gas, we get fresh air, and we see more things.” About sums it up. As I was leaving my son’s school, a friend and fellow xtracycler was pulling out at the same time as me. We rode together for a few minutes until our paths diverged; we enjoyed a 5-minute chat we wouldn’t have had in cars. On the way home from work a woman on bike commented on my ride and we chatted for a couple of minutes as she shared her excitement about one day having a child and riding together on a cargo bike. She said these little spontaneous connections are her favorite part of biking. I picked up my son from our little neighborhood day care and we walked home, pushing the bike so we could extend the trip by a few minutes. At a slower pace the trip is its own experience rather than just a means to an end. We enjoyed the time talking about his day, scratching our backs on the bark of a tree, collecting magic rocks, jumping over cracks. I’m with you, Anne. I love the exercise, I taught my son about not burning gas, I thrive on the fresh air, I love seeing “more things” in the intimate connection with our surroundings that biking affords. All these “drive” me to bike. But what it really comes down to is joy. I experience more joy in my life biking than I do driving. Even on the cold, wet days of Oregon winter. Especially on the cold, wet days. The extra few minutes being smart about layers is well worth the feeling of being in the elements, totally comfortable. Connected with my world in a way I can’t be within the waterproof, temperature controlled box of my car. Yes… My car. I have to travel all over the (large) county for my job. For years I thought I couldn’t be a bike commuter because of it. Then one day it dawned on me — when I didn’t accidentally drive out of habit, my evening and weekend trips were all by bike. So for the last year the car has stayed parked at the office and biking has become the habit. In all honesty, sure, there are moments when my son or I would choose to drive if the car were in the driveway, but the simple answer that “The car is at the office” eliminates the need to find motivation to bike. And we are always happier in the end. More bike, more joy. Hi Heather. I love all of these stories. 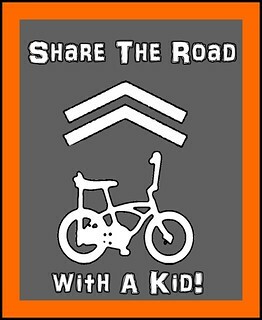 Running into people and having impromptu encounters, extra time with your kids, all excellent reasons to choose bikes! Joy in the simple things of life. I like the fact that you are out interacting with what’s around you instead of cocooned inside a car. I’ve discovered little hills that I didn’t know existed when driving a car. I enjoy the smells of woodsmoke and rain soaked sage. I enjoy saying ‘Hi’ to fellow cyclers and pedestrians as I wheel past. I enjoy the physical exertion of sprinting fast to get through a light, or to make a lane change for a turn. I like the fact that I’m making my way around town doing something that brings a smile to my face, instead of rage and frustration as driving a car so often does. And I really enjoy wheeling by the local gas stations, taking note of the ever increasing prices and knowing that the wheels I’m on don’t ever need to stop there! Hi Bill, Thanks for sharing all of your stories. I enjoy all of these things too! Bikes = sensory goodness! When it is just me going somewhere I like to ride but it hurts to take my son to kindergarten. The morning drama, the always being late, they are standard any which way and bicycling is usually faster than the bus & I can’t park a car at work, so in theory it should be great. However, I am finding the SHEER PHYSICAL PAIN a much bigger deterrent than I expected. It is hard to face 20 minutes of burning lungs and legs each morning as I grind straight up hill dodging trucks. I am hoping that the end of cold flu season might help my lungs, but instead of the joy I hoped for I am finding tears and pain. (while my son yells at me to go faster). My main motivation these days is knowing that other parents are finding ways to do this (and they can’t be in this much pain) and the hope I can eventually figure out a better set up. Hi MMcC, I’m cheering for you! Don’t give up. Keep at it, one day at a time. II commute to work by bicycle daily, rain or shine. It’s not very far; about 9 miles round-trip. There’s a long hill to climb on the way home that never seems to get any easier, but maybe that’s because it comes at the end of a long day. We’ve been car-free for a while (2 years in March), and in the mists of time Before Parenthood we were car-free for 7 years. I’m a bike guy. I love bikes, and can find something to like about virtually any bicycle. The reason I commute by bike, whether to work or the store or the post office or the pub for trivia, is because I like to ride bikes. Getting groceries is a chore, but it was a chore when we had a car, too. Motivation for me is that I get to ride my bike; to me it’s joyous, liberating fun. I think you have to find the joy in it to keep motivated long-term. Like you mention in your post, the thrill of “saving money” or “saving the environment” fades quickly. When riding the bike is its own reward, any errand is another opportunity to go for a ride. Don’t give up, MMcC. Find a better route, a better bike, whatever it takes to get to spring. By spring you and your body will be acclimated to the demands of the ride, you’ll feel good off the bike, and you’ll have another reason to be proud of yourself for persevering. You can do it. Hi Shawn, Thanks for the comment. Cheers to “joyous, liberating fun”! Pingback: Why We Ride: Thoughts on Motivation | ridesavvy!